NEW YORK--(BUSINESS WIRE)--Fifteen of the most promising young leaders working in communications in the New York metropolitan area were honored on Friday, November 3 with PRSA-NY 15 Under 35 Awards, presented by The New York Chapter of the Public Relations Society of America (PRSA-NY) at a luncheon held at Blue Water Grill in New York’s Union Square neighborhood. The awards, now in their second year, acknowledge and celebrate 15 of the foremost emerging leaders in communications in the New York metro area, the global center of media. The awards stand apart in being the only of their kind honoring rising New York PR professionals, awarded exclusively by those best equipped to judge: New York PR professionals. Following a six-week open nominations process, the recipients were chosen by a panel of distinguished industry judges as representing the “Best of the Best” among public relations practitioners ages 35 and younger, with more than five years of work experience in the New York City metropolitan area. The luncheon’s keynote speaker, Sara Skirboll, embodies the letter and spirit of the awards. After building her career at highly-regarded PR agencies in New York City, Skirboll, not yet 35 herself, was tapped by Austin, Texas-based savings destination RetailMeNot, which she regularly represents in top national and local media as its Shopping and Trends Expert. Joining Business Wire as event sponsors were 360PR+, SHIFT Communications, Affect, The Doescher Group and Ketchum. Wine was provided courtesy of Carlo Huber Selections. Biographies and individual photos of the honorees can be found in the luncheon program here. Event photos can be found in an album on the PRSA-NY Flickr page. Introduced in 2016, the awards are presented annually. Nominations are open to anyone 35 and under who works in PR in the New York Metro area (in-house and/or at agencies, including self-nominees) with at least five years of PR experience. Entrants who were previously submitted but not selected may be nominated again in a future year so long as the age criteria is still met. Award recipients are chosen by a panel of distinguished industry judges as representing the “Best of the Best” in public relations practitioners. An awards luncheon for the honorees and their colleagues, family and friends will follow in the Fall of 2017. Award recipients will also be invited to sit on the PRSA-NY Young Professionals Advisory Committee, part of the PRSA-NY Board of Directors, from January 1, 2017 through December 31, 2018. The Public Relations Society of America, New York City chapter is one of the founding chapters of the Public Relations Society of America, the world's largest professional organization for public relations practitioners. Founded in 1947, the chapter serves the interests of public relations professionals working in business and industry, counseling firms, government, associations, hospitals, schools, professional services firms and nonprofit organizations. Chapter board and committee members are volunteers who live and work in the New York metropolitan area. For more information, please visit prsany.org. Follow PRSA-NY on Facebook, Twitter and LinkedIn. 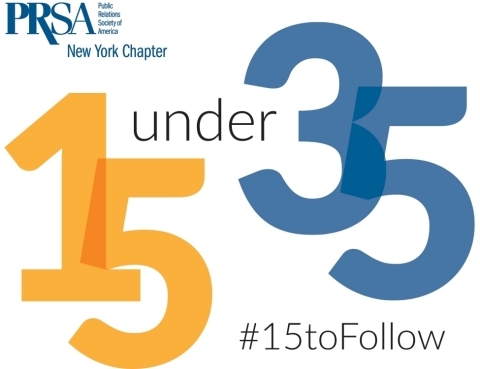 For inquiries or question on the awards, please reach out to 15toFollow@prsany.org. 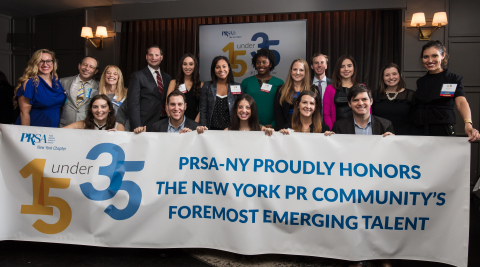 PRSA-NY honored fifteen of the most promising young leaders working in communications in the New York metropolitan area on Friday, November 3rd.